In a frozen, apocalyptic landscape, destruction abounds: great walls of ice overrun the world and secretive governments vie for control. Against this surreal, yet eerily familiar broken world, an unnamed narrator embarks on a hallucinatory quest for a strange and elusive “glass-girl” with silver hair. He crosses icy seas and frozen plains, searching ruined towns and ransacked rooms, all to free her from the grips of a tyrant known only as the warden and save her before the ice closes all around. A novel unlike any other, Ice is at once a dystopian adventure shattering the conventions of science fiction, a prescient warning of climate change and totalitarianism, a feminist exploration of violence and trauma, a Kafkaesque literary dreamscape, and a brilliant allegory for its author’s struggles with addiction—all crystallized in prose glittering as the piling snow. 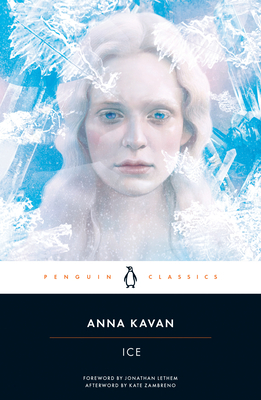 Kavan’s 1967 novel has built a reputation as an extraordinary and innovative work of literature, garnering acclaim from China Miéville, Patti Smith, J. G. Ballard, Anaïs Nin, and Doris Lessing, among others. With echoes of dystopian classics like Ursula Le Guin’s The Lathe of Heaven, Kurt Vonnegut’s Cat’s Cradle, and J. G. Ballard’s High Rise, Ice is a necessary and unforgettable addition to the canon of science fiction classics. Anna Kavan (1901–1968) was born Helen Woods. She began her career writing under her married name Helen Ferguson, publishing six novels. It was only after she had a nervous breakdown that she became Anna Kavan, the protagonist of her 1930 novel Let Me Alone, with an outwardly different persona and a new literary style. Much of her life remains an enigma, but her talent was none the less remarkable, and her works have been compared to that of Doris Lessing, Virginia Woolf, and Franz Kafka. Kavan suffered periodic bouts of mental illness and long-term drug addiction—she had become addicted to heroin in the 1920s and continued to use it throughout her life—and these facets of her life feature prominently in her work. Her widely admired works include Asylum Piece, I Am Lazarus, and Julia and the Bazooka (published posthumously). She died in 1968 of heart failure, soon after the publication of her most celebrated work, Ice. Jonathan Lethem is the New York Times bestselling author of nine novels, including Dissident Gardens, Chronic City, The Fortress of Solitude, and Motherless Brooklyn, and of the essay collection The Ecstasy of Influence, which was a National Book Critics Circle Award finalist. A recipient of the MacArthur Fellowship and winner of the National Book Critics Circle Award for Fiction, Lethem’s work has appeared in The New Yorker, Harper’s Magazine, Rolling Stone, Esquire, and The New York Times, among other publications. Kate Zambreno is the author of the novels Green Girl and O Fallen Angel, as well as two works of experimental nonfiction, Heroines and Book of Mutter. She is at work on a series of books about time, memory, and the persistence of art. She teaches in the writing programs at Sarah Lawrence College and Columbia University.